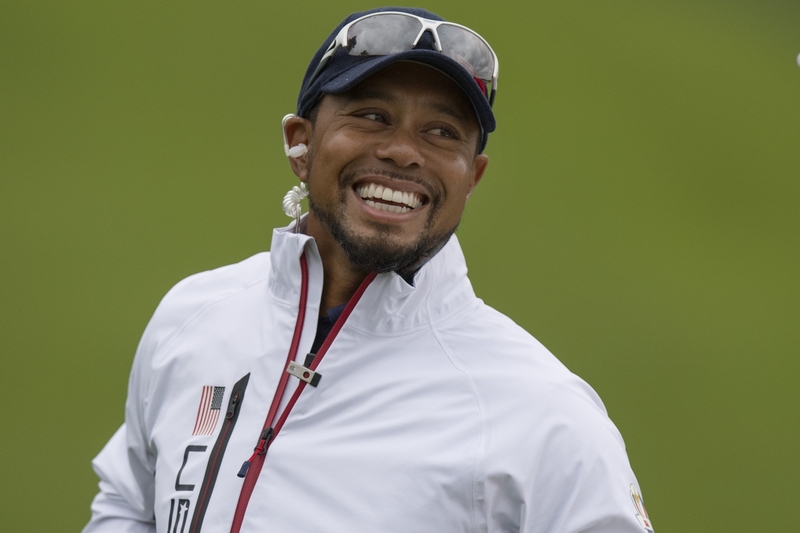 I am heartened to hear the news that Tiger Woods is planning yet another comeback to the world of professional golf. You have to understand how I feel about this guy. I will concede in a New York minute that he has proved himself to be a dirt bag of a husband. His serial philandering was too much for his ex-wife to bear. He got caught up in that nasty scandal — and then his health went bad. I tend to separate sports celebrities’ personal life from their exploits on their respective fields of competition. Tiger has 14 major titles under his belt. He’s seeking to break Jack’s record of 18. I once thought it was a done deal. It now appears out of reach, given his recent performances on the links. Whatever, he says he is coming back in December. Tiger has gone through those back surgeries. He’s suffered some personal indignities along the way. He and rival Phil Mickelson revealed recently that they really are pals, that their so-called mutual dislike was trumped up. Tiger will have a tough road ahead to regain his top-tier ranking. The pro golf game is full of young guns ready to take their place among the greats of the game: Jordan Spieth and Dustin Johnson come to mind. They are as fearless as Tiger Woods has proved to be in the heat of competition. So … welcome back, Tiger. This golf fan is pulling for you. This young man is the next superstar? Jordan Spieth seems like a quiet young man. He hails from Dallas. He plays golf for a living. He’s pretty good at it, too. He won a golf tournament over the weekend by sinking a shot out of a sand bunker. Spectacular stuff, to be sure. For a golf fan who is still waiting for the return of its most recent super-duper star, a guy named Tiger, I am pleased to see another young man emerge to capture the attention of the golfing world. Golf is about as statistic-happy a sport as, say, baseball. Consider this little tidbit the announcers tossed into our laps: Spieth, who’s 23 years of age, is the second-youngest player ever to win his 10th professional golf event. The youngest is the aforementioned Tiger Woods; the third youngest is a guy out of Ohio named Jack Nicklaus. Think about that for a moment. Tiger Woods, Jordan Spieth, Jack Nicklaus. The young Texan surely understands that he currently is walking among some pretty tall cotton. But I do enjoy watching pro golf on TV more than pro football. Pro basketball, too, except when the Portland Trail Blazers are on the tube. 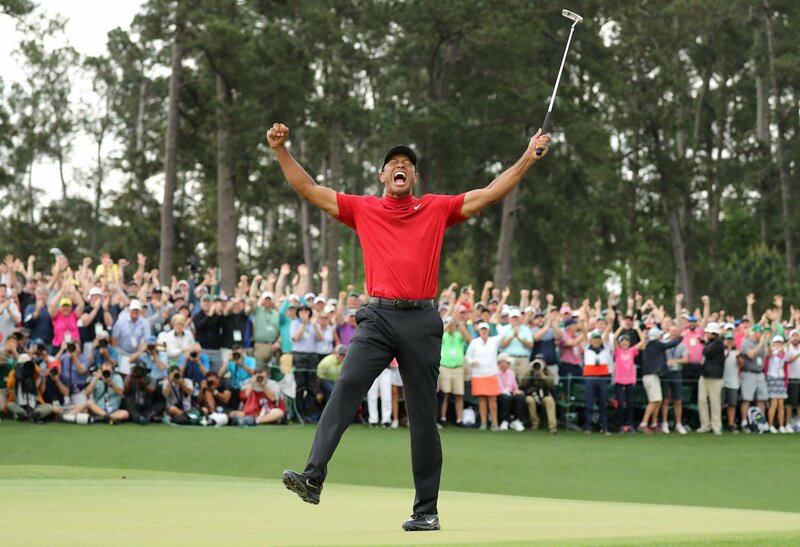 Accordingly, I keep hoping for a comeback from a young man named Eldrick “Tiger” Woods, who announced this week he is going to skip next week’s Masters Tournament, an event he has won four times. Tiger’s back is acting up. He can’t rehab it sufficiently to allow him to play at a competitive level. So, he’s sitting out an event that the great Jack Nicklaus once said he’d win more Masters green jackets than he and the late Arnold Palmer did combined; Jack won six of ’em, Arnie won four. I’m not entirely sure why I remain drawn to Tiger Woods, the golfer. Tiger the husband turned out to be pretty much of a dirt bag, as he cheated wildly on his gorgeous then-wife, Elin. It pretty much went to hell after that for Tiger. He hurt his back. His major championship total stands at 14; he says he wants to surpass the 18 majors owned by Nicklaus. I don’t know what pro golf’s TV ratings have done since Tiger hit the skids. I’m guessing many TV watchers are like me: They’d prefer to watch Tiger on the course than nearly anyone else. I want the young man to make a full comeback. Do I care if he breaks the all-time major championship record? Not really. Jack Nicklaus, by all rights, should stand as the greatest of all time. Tiger Woods belongs on the golf course — and on my TV screen. Sitting on my desk at home is a golf program. It contains a couple of signatures. One of them belongs to Jim Dent, a pretty good journeyman golfer known in his day as a big hitter off the tee. The other signature belongs to The King of golf, Arnold Daniel Palmer. Arnie died today at the age of 87. Man, I am sad tonight. Here’s my Arnie story that I want to share in remembrance of one of my favorite all-time athletes, who ranks with Mickey Mantle, Muhammad Ali and Mario Andretti as sporting icons I used to root for over many years. I traveled to Orlando, Fla., in October 1981. My late aunt and uncle — Tom and Verna Kanelis — lived there at the time. Tom was an avid golfer and I played a couple rounds of golf with him while visiting them in central Florida. One evening, he asked me if I wanted to see the World Team Championship at the Walt Disney World. “Arnold Palmer is going to be there,” he said. “Are you kidding? Absolutely!” I answered. We drove to the Disney resort the next day. Tom had gotten a couple of tickets to watch the first round of golf. We went to the practice tee where — son of a gun! 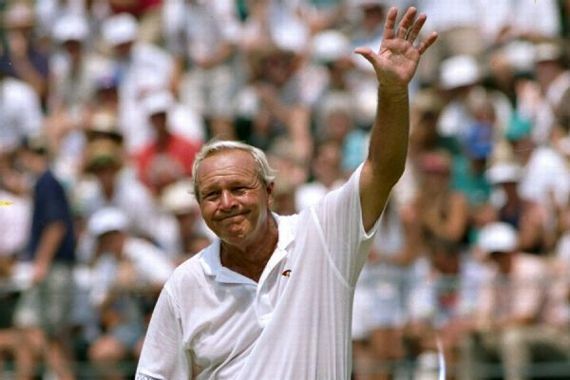 — there was Arnie hitting practice shots on the driving range alongside Jim Dent. I asked Dent to sign my program after he was done hitting some tee shots. He did so with a smile and was a terrific gentleman. Then we waited for Palmer. Arnie finished hitting his practice balls and walked off the tee to a small gaggle of fans. You hear about superstars who are aloof. Some of them refuse to sign autographs. Arnie was neither. He was friendly, engaging and as he signed his name to the documents thrust toward him, he took a moment to talk to us individually. “Are you enjoying yourself?” I recall him asking me. “Have fun out there,” he said. I recall telling him I planned to walk the course among the fans accompanying him and his playing partner, Larry Nelson. “Have a great time,” he said. OK. My story isn’t unique. It’s like perhaps thousands of stories that other golf fans — and Arnie fans — can tell. I want to share it here as my way of conveying that this guy was the real deal. He truly was golf’s greatest ambassador. He was an everyman who happened to play a hell of a great game of golf. Rest in peace, Arnie. You surely gave this fan one of the great thrills of his life. Tiger Woods didn’t win the PGA this past weekend. He’s still looking to win his 15th major golf tournament. And strange as it seems, golf’s pundit class is giving him a bad time because he hasn’t won a major since 2008. Even if Tiger Woods never wins another major championship, he’ll be able to look back on what has been an extraordinary golf career. He’s won 79 PGA events overall, second to Sam Snead’s 82 wins. He is stuck on 14 major wins, with Jack Nicklaus ahead of him with 18. The way I see it, being mentioned in the same sentence with Slammin’ Sammy and the Golden Bear puts Tiger in the middle of some pretty tall cotton. I think he’ll win more majors. Whether he catches Jack is another matter. Still, it shouldn’t really matter when measuring the impact Tiger Woods has had on the game of golf. All of this armchair handwringing reminds of what sports talkers used to say about auto racing legend Mario Andretti, who’s generally recognized as one of the greatest drivers in the history of his sport. But he won only a single Indianapolis 500 race, in 1969. He figured to win many Indy races when he arrived on the scene in 1965. He had bad luck at Indy. Someone finally asked Mario to comment on one of his many failures to win a second Indy 500. His answer, which I only can paraphrase now, was classic. He said he doesn’t measure the success of his career by what he didn’t do at Indy. He prefers to look instead at the big picture: Daytona 500 victory in 1967, Formula One championship in 1978 … and a host of victories at tracks worldwide of all kinds and shapes racing open-wheeled cars, NASCAR stock cars, Formula One road course vehicles. I believe the totality of Tiger Woods’s career, when it finally concludes, will measure up. Tiger Woods is two shots out of the lead at the British Open. Admission time: I’m pulling for Tiger to win this event Sunday. It would be his 15th major championship, three shy of the great Jack Nicklaus’s record. I’m not yet sure I want him to beat Jack’s record. I’m still wrestling with it. It might be different had Woods not acted like a dirt bag about four years ago when it was revealed he was a serial philanderer who couldn’t remain faithful to his gorgeous wife. Still, I’ve struggled as he’s struggled to regain his top form. He finally got it back this year, returning to No. 1 in the world golf rankings. But he hasn’t won a major championship since 2008. He’s in position now to win his 15th if he can make up those two strokes and get past the leader, Lee Westwood, who himself is no slouch on the links. Westwood will have the benefit of playing before a home crowd of fellow Brits. Will the pressure spur him on or will it make him choke? As for Tiger, he at one time seemed immune to those kind of atmospherics. He just dialed in his game, turned it on and off he went. Would I want to hang with Tiger? Not for a minute. He’s not my kind of guy. He is, however, fun to watch hit a golf ball. I’ll be pulling for him Sunday … along with many millions of others who would admit that they, too, watch golf often only when Tiger is on his way to pick up the winner’s trophy.